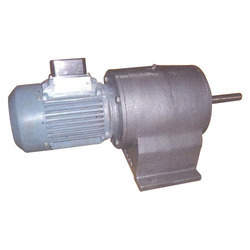 Our organization is engaged in manufacturing and supplying of a superior range of Geared Motors. Our array comprises geared motors that offer unrivalled performance and matchless efficiency. We have immense experience in manufacturing these motors at reduced production costs without compromising on quality. Further, we can provide our clients them in standards as well customized specifications. We make available a superior quality of Geared Motor, which are known for their precise functionality. Manufactured by using quality-tested raw material and components, these products are widely appreciated for their compact designs, precise dimensions, performance and durability. We make sure that these are tested for their consistent quality and functionality, before being dispatched to the clients.